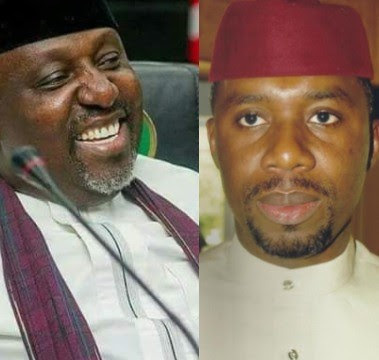 Imo state governor, Rochas Okorocha, says nothing will stop his son-in-law, Uche Nwosu, from succeeding him as he has already been “ordained by God” and supported by 24 out of the 27 local government areas in the state. Governor Okorocha said this in a statement released by his Chief Press Secretary, Sam Onwuemeodo. Okorocha was reacting to claims that his son-in-law, who is his chief of staff, supervised the assault on the Catholic Archbishop of Owerri, Most Rev. Anthony Obinna, at a funeral in the state over the weekend. There were reports online that Nwosu had led other APC members to the funeral where they attacked the clergyman who spoke against his political ambition. Okorocha in his statement, said Nothing will stop his son in-law from taking over from him as it has been ordained by God and supported by 24 out of the 27 local governments in the state. Nwosu is married to Governor Okorocha's daughter, Uloma.